Since /Bl0N0;, i> A'HHK)No2+n2(), the denominator /Brf)NS>, + AJlHrONO:+„ „ = /lw)NO, and the rate of Br0N02 hydrolysis scale linearly with the rate constant rB<1! )0l,IU)—which, as we discussed previously, is linearly proportional to the aerosol SAD. It should be noted that the condition /BtONo2 ? ;> /;HHl! )N0 liH l0 is satisfied even for the high aerosol SAD found after the eruption of Mount Pinatubo . Thus, the importance of the hydrolysis of BrONO, increases with increasing length of day and with increasing aerosol SAD. This can be contrasted with the hydrolysis of N2()5, which becomes less important as the exposure to sunlight by an air mass increases and exhibits a saturation condition where continued addition of aerosol abundance does not increase the rale of N2Os hydrolysis. These four reactions convert chlorine from the long-lived reservoir species HC1 and C10N02 to the more labile species Cl2, HOC1, and BrCl. When exposed to sunlight, Cl2, HOC1, and BrCl are rapidly photolyzed to produce Clr. Thus, all of these reactions increase the abundance of CI, at the expense of CI reservoir species. The reactions involving CIONO, also produce the less labile species UNO,, which reduces NO,. Figure 6.3 Reactive uptake coefficients y for various reactions of stratospheric importance as a function of temperature, y is for first-order loss of CIONO,. HOC1, and HOBr. Conditions are typical of the lower stratosphere: 60 hPa, 5 ppmv H O, and aerosol radius 0.2 jam. [MCI] is 1.5 ppbv, except for the C10N02+H,0 reaction, where [HC1| is zero. The C10N0,+HCl and CIONO,+H.O formulations arc from Hanson and Ravishankara [301 and Hanson , the HC1+HOC1 formulation is from Donaldson et al. 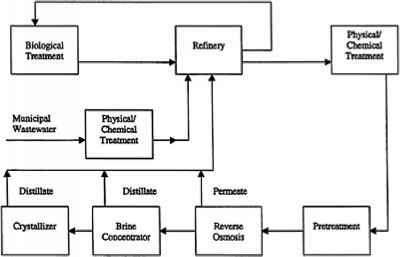 [2021, and the HCl+HOBr formulation is from D. R. Hanson (personal communication, 1998). dependent. At temperatures typical of the lower stratosphere (> 210-220 K), these reactions have reactive uptake coefficients that are so small that the reactions are negligible. At extremely low temperatures (below -200 K), such as those found in the lower stratosphere at high latitudes in winter, these reactions have reactive uptake coefficients that are large enough for the reactions to become important. For temperatures between these extremes (200-210 K), the reactive uptake coefficients are such that these reactions are negligible for the background SAD, but potentially important for an enhanced SAD. such as that found immediately after a volcanic eruption. [46,106,107,116,200,203]. Because the partitioning of each chemical family generally depends on the partitioning of other chemical families, this direct effect led to changes in the partitioning of the other chemical families. Note that this ratio is proportional to 1/[N02]. Assuming that the reduction in NO, leads to a reduction in NO,, CI, will increase at the expense of ClONO,. This inverse relationship has been verified by observations [70|. It should be noted that because the abundance of ClONO, in the lower and mid-stratosphere is 5-20 times the abundance of CIO, large fractional increases—e.g. factors of 2-3—in CIO are accompanied by small fractional changes in the abundance of ClONO,. Note that the assumption of the photochemical steady state for HCI is not necessarily correct owing to the long lifetime of HCI in the lower stratosphere (weeks). We expect, however, that Equation (6.9) gives an accurate indication of how [HCI] will, on average, change as the abundance of other constituents changes. According to Equation (6.9), the abundance of HCI is proportional to the abundance of CI atoms. As discussed above, the abundance of CI, is proportional to I/[NO,], so the decrease in NO, causes the abundance of CI, to increase. At the same time, however, the decrease in NO, changes the partitioning between CI and CIO. Equation (4.9) says that [C1]/|C10] is proportional to [NO|; so while CI, is increasing, the decrease in NO, also causes CI to make up a smaller component of CI, If the ratio of [NO] to [NO,] remains fixed, then these two effects cancel, and [Cl[ remains unchanged. If there is no change in O, or 7NO„, the ratio [NO]/[NO,] will be unchanged by a reduction in NO,. Thus, the abundance of CI atoms will remain unchanged—despite a significant increase in CI,. Reiterating, this occurs because the increase in [CI,[ = [CTO[ + [Cl[ driven by the decrease in NO, is exactly compensated for by a decrease in the [C1]/[C1J ratio driven by the decrease in NO. Because [CI] does not change, we expect little change in [HC1] from the direct effect of decreases in NO,. Thus, a reduction in NO,, holding everything else constant (OH, CH4, and 0„ rate constants, photolysis frequencies), increases CI, at the expense of ClONO,, while leaving HC1 unchanged. In reality, of course, the response of CI, partitioning will depend on the changes in all of the geophysical parameters. It turns out, however, that the decrease in NO, is the dominant effect and can explain most of the changes in the partitioning of Clr. Observations verify that the eruption of Mount Pinatubo in 1991 did indeed have a dramatic effect on the partitioning of Cly. Concomitant with the decrease in NO„ CIO (which accurately approximates CI,) was observed to increase [46,70,116,2041, with little change observed in HC1 [205|. Models [206-209[ estimate that, in the years following the eruption of Mount Pinatubo, CI, increased by thirty to several hundred percent, depending on the latitude, time of year, and aerosol abundance. Next we turn to the HO, family. We saw in Chapter 4 how the hydrolysis of N,Os and BrONO, followed by the photolysis of HNO, produces HO, (cycles (4.55) and (4.56)). The increase in the aerosol SAD after a volcanic eruption therefore leads to an increase in the rate of HO, production, which tends to increase the HO, abundance. The increase in production rate due to hydrolysis reactions can be significant: at high surface areas, production of HO, from the hydrolysis of BrONO, competes with the direct gas phase oxidation of H20 (reaction (4.54)) , Additionally, the decrease in NO, slows the loss of HO, due to formation of HNO, (reaction (4.42)), which further tends to increase HO,. Models [206-208] estimate that, in the years following the eruption of Mount Pinatubo, HO, increased by 20-100%, depending on the latitude, time of year, and aerosol abundance. In addition to affecting the total abundance of HO,, NO, also plays a role in partitioning HO,. Equation (4.66) indicates that the ratio [OH]/[HO,] is proportional to the abundance of NO. 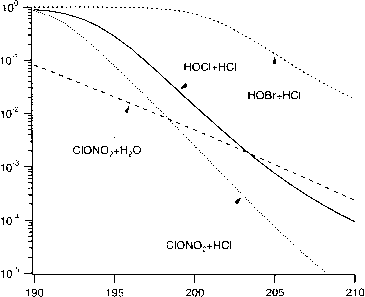 so a reduction of NO leads to increased HO, relative to OH, an effect verified by lower-stratospheric observations of HO, , This is potentially important because it is the H02 radical that rate limits the most important O, loss cycles: increasing HO, at the expense of OH will increase the loss rate of O, attributed to HO, chemistry. It should be noted, however, that because the abundance of HO, generally exceeds OH by a factor of 5, significant increases in the ratio are accompanied by modest increases in the absolute abundance of HO,. The net effect of heterogeneous chemistry on odd-oxygen abundance As we have discussed several times, the total loss rate of O, is twice the sum of the rates of the catalytic cycles. For the NO, catalytic cycle the rate of O, loss is proportional to the abundance of NO,. The increase in the aerosol SAD leads to a reduction in NO, and therefore a decrease in the loss rate of O, due to the NO, cycle. This same reduction in NO,, however, leads to an increase in the rate of O, loss due to the CI, and HO, catalytic cycles. These two effects oppose each other, and the sign as well as the magnitude of the net effect depends on which of these changes is largest. In the case of the eruption of Mount Pinatubo, in the lower stratosphere the increase in the rates of the CI, and HO, catalytic cycles dominated the decrease in the rate of the NO, catalytic cycle , As a result, the total O, loss rate increased with decreasing NO,, leading to a decrease in lower-stratospheric O,. In the mid-stratosphere, on the other hand, the decrease in NO, dominated the increase in CI, and HO,. As a result, the total O, loss rate decreased with decreasing NO,, leading to an increase in mid-stratospheric (J, . This is shown schematically in Figure 6.4.